In the historic downtown of High Point, North Carolina one of the largest home textiles shows takes place at the Market Square Towers. Showtime is presented twice a year by the International Textile Market Association (ITMA) where they host over 800 buyers from all over the world. 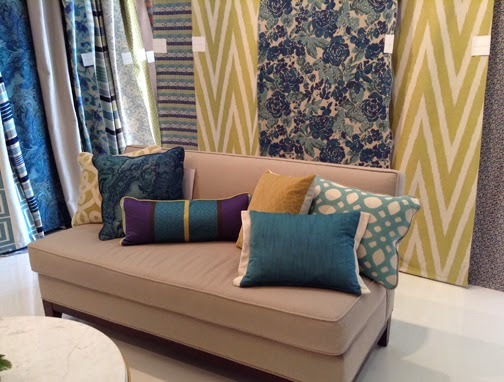 I highly anticipated my first trip with the President of Greenhouse, Brian Bunch and co-director of Product Development, Tiffany Tolliver to preview all of the latest fabric colors and design trends. We spent the next five days previewing thousands of fabrics, vinyl and leather with over 70 vendors carefully considering our customers' essential needs. We also took into consideration our upcoming color books with big and bold fabrics for our web exclusives. Throughout the week, we saw countless colored textiles from suedes, velvets, textures and wovens all paired with brightly colored patterned coordinates. We previewed companies' best sellers and this season neutral colors were particularly in vogue with their timeless qualities. My favorite showroom was Circa where the brightly colored samples were draped from the ceiling to the floor. From contemporary chevrons, ikats and even a cherry blossom design, this was an interior designer's dream. The room was filled with a wide assortment of transitional to contemporary fabrics and we felt like kids in a candy store. We were introduced to a boutique company called Keystone Weaving Mills. All of their fabrics are made in the USA with an Eco-friendly story. Keystone has a beautiful selection of neutral based textured wovens and included a brightly colored tangerine into the mix to add color. We had the opportunity to meet their distinguished design director, Kristan Steigelmann. 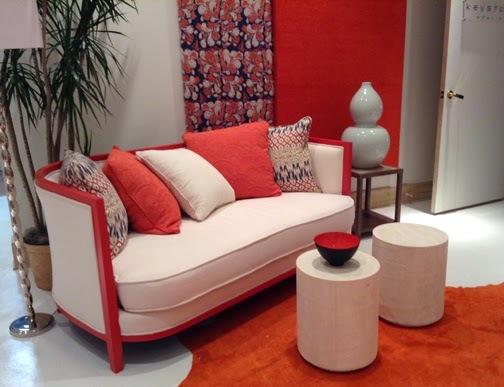 Their upholstered furniture showcasing their latest fabrics definitely are eye-catching. This was an extremely successful Showtime event for Greenhouse Fabrics that had great depth of new products available. We are looking forward to introducing these new and exciting fabrics over the coming months to our customers.